I first met Robbin, the Italiophile behind Vineyard Adventures, in Washington, DC. I managed to steer her toward a sushi restaurant I hadn't been to in a few years. This time, I was on her turf in New York City, which meant we were destined for Italian. She had invited me to join her, another New Yorker, and a German couchsurfer who was only in town for the night. We convened outside Keste Pizzeria & Vino on a cold Sunday night. The narrow Italian pizza place was packed, and we were relegated to seeking warmth in the little vestibule between the sidewalk and the restaurant's dining room. We must've waited there patiently for a good 20-30 minutes before a table became available. And it happened that our table was the one that sat flush against the edge of the little kitchen. It wasn't the most comfortable seating option, having one's back against the wall, literally, however it did allow me to capture a great photo of the pizza making process going on behind us. Robbin tested out her new Kodak HD flipcam by shooting a short video. I was in the right company. 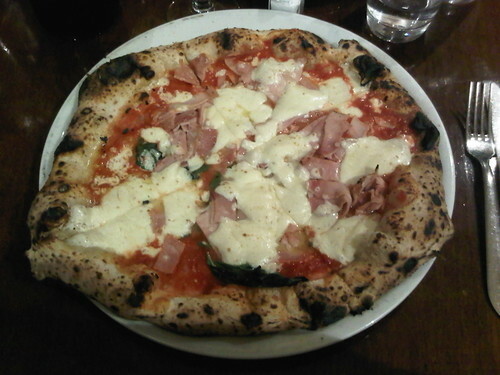 I went with the Prosciutto Cotto, made up of tomatoes, fresh mozzarella, imported cooked ham, basil, and extra virgin olive oil. Simple and delicious. I thought the crust was perfect, and despite my intention to take half the pizza home, I managed to devour it all in one seating, save a few bits of crust which were sacrificed in order to leave room for dessert. Robbin ordered a sparkling red wine for us, which was new to me, though I enjoyed it. I'm so use to strong cabernets and merlots, that a lighter red made for a nice change. Robbin then brought up gelato as a desert option, and memories of 3-scoop cones in Italy flashed through my mind. More recently, I'd enjoyed gelato in Australian beach spots like Byron Bay and Surfer's Paradise, but that was almost 2 years ago. Hard to believe. We walked a few paces down Bleecker, and entered Grom Gelato, which was situated across the street from Murray's Cheese (which I will have to check out during a future visit). After a few quick tastings, I ordered a cup of 1/2 tiramisu and 1/2 dark chocolate. 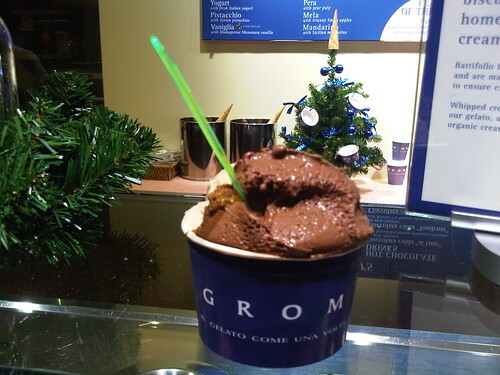 Rich, decadent, and highly unhealthy, gelato is always a good decision! Just because you're backpacking and/or couchsurfing, doesn't mean you can't enjoy great food. Every trip I take to NYC is proof-positive of that. 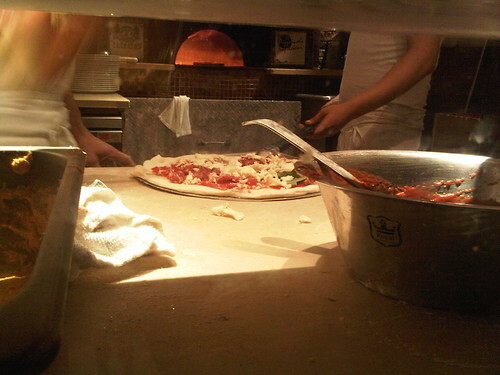 That pizza looks amazing, Ican't wait until I make it to NY next!